News of the Department of Homeland Security’s plans to conduct immigrant deportation raids at the outset of 2016 circulated just before the Christmas holiday, and the first raids got underway last weekend. They are part of the Obama administration’s efforts to stem a wave of women and children who have arrived in the U.S. since 2014, many fleeing violence in El Salvador, Guatemala and other Latin American countries. Officials said the raids target those whose asylum claims have been denied and who now face deportation orders. On Monday, January 4, DHS confirmed that 121 people – primarily in Texas, North Carolina and Georgia – had been detained. Among the communities where raids were reported were Norcross and the greater Atlanta area in Georgia and Dallas. In Georgia, where immigrant rights organizations received several calls about raids, children as young as 4 were reportedly detained. The actions drew condemnation from immigrant communities and advocates. “It is inhumane,” Rosa Vargas Morales told The Guardian. Vargas Morales left Guatemala and came to Georgia in 2014. She was detained over the weekend with her 17-year-old son and 11-year-old daughter. “How can you put an 11-year-old through this? It’s going to leave a mark on her life forever,” Vargas Morales said. 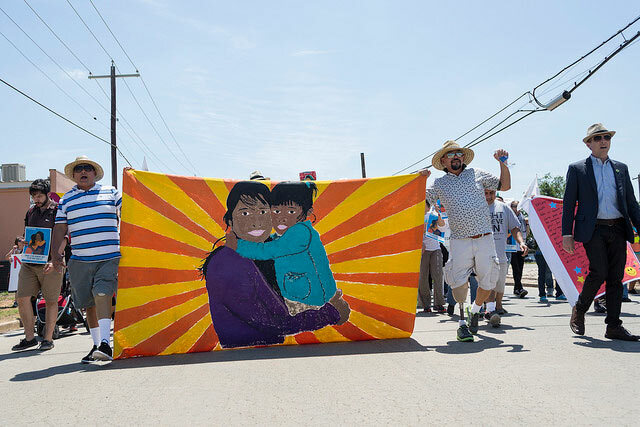 Immigrant rights supporters sprang into action to protect communities and fight back. An online petition calling on the president to end the raids has garnered over 35,000 signatures. Groups are also circulating “Know Your Rights” materials advising people not to open the door to Immigration and Customs Enforcement officials unless they have a warrant and not to say or sign anything without a lawyer. Faith institutions involved in the recently revived Sanctuary Movement pledged to offer a refuge of last resort to protect people from deportation. Meanwhile, legal advocacy groups have stepped in to help detained families facing imminent deportations. Studies have shown that legal representation is the most important determinant in whether asylum is granted, but lack of access to sound legal counsel has been a major issue. On Tuesday, January 5, an immigration court blocked the deportation of four families who had been detained in the raids to give them time to appeal their asylum cases. Allie Yee joined Facing South and the Institute for Southern Studies in July 2014 and became associate director in September 2016. Working closely with the executive director, she manages the Institute’s key programs, strategic research and internal operations. Her research focuses on demographic change, immigration, voting and civic engagement in the South, and has been featured in The New York Times, The Los Angeles Times, The Greensboro News & Record and AlterNet. Follow her on Twitter: @allieyee_nc. Asylum seekers hoping for protection often face difficult legal obstacles.